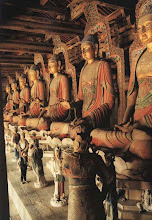 This glossary is an aid for readers unfamiliar with the Buddhist vocabulary. Definitions have been kept simple, and are not necessarily complete. AGAMAS – the Sutras of the Small Vehicle. 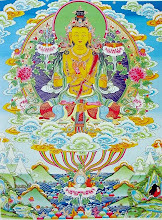 ANUTTARASAMYAKSAMBODHI – the Utmost, Proper, and Equal Enlightenment. The highest enlightenment, realized by Buddhas. 2. Killer of thieves. Arhats have killed the thieves of the afflictions and outflows. 3. Non-born. An Arhat dwells in the forbearance of the non-arisal of dharmas. ASAMKHYEYA – uncountable. An extremely large number. 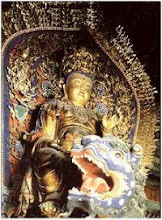 AVALOKITESVARA – one of the major Bodhisattvas. His name means One Who Contemplates the Sounds of the World, and One Who Contemplates Sovereignty. In Chinese he is called Kuan Yin or Kuan Shih Yin. BHIKSU – a monk who has received the transmission of the complete code of Bhiksu regulations (227-250), depending on recensions). Bhiksus and Bhiksunis, as well as corresponding novices, are the only members of the Sangha as it was instituted by the Buddha. BHIKSUNI – feminine form of Bhiksu. BODHISATTVA – from Bodhi, enlightenment, and Sattva, a being. A bodhisattva is an “enlightenment being,” i.e., one who has resolved to win enlightenment for himself and for all living beings. BRAHMAN – a member of the highest Indian caste. 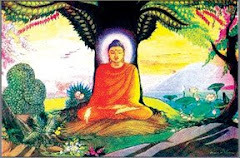 BUDDHA – from Budh-, to awaken, The Awakened One. One who has reached the Utmost, Right, and Equal Enlightenment. Buddhahood is inherent in all beings. As long as it remains unrealized they remain beings; once it is realized they are Buddhas. 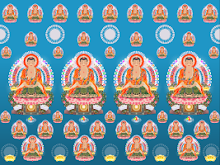 There are infinite numbers of Buddhas. CHI LI SHE – a class of fire spirit. CHI LI CH’A – a class of fire spirit. DEVADATTA – the Buddha’s cousin and rival who constantly tried to oppose the Buddha’s teaching and create schisms in the Sangha. He tried to bury the Buddha under an avalanche and succeeded in injuring one of the Buddha’s toes. For having shed the Buddha’s blood he fell alive into the hells. DHARMA – a law, rule, method, norm. This is one of the key terms in Buddhism and covers a multitude of meanings. 1. The teaching of the Buddha, called Buddhism in English, is called Buddhadharma or more simply, Dharma, in both Chinese and Sanskrit. 2. Dharma: a. a specific element of psycho-physical existence. There are usually one hundred in the Great Vehicle, and from 72 to 86 in various Hinayana traditions. The Sarvastivadins list 75. b. Any one of the methods of cultivation undertaken by spirants to the holy results attainable by the practice of the Buddhadharma. In this usage the recitation of sutras, the performance of ceremonies, the practice of meditation, the recitation of the names of Buddhas, and so forth, are all dharmas. DHARMA MASTER – a teacher of Dharma. A polite term of address for members of the Sangha. 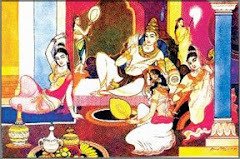 DHUTA – ascetic practices which may be voluntarily assumed by cultivators. There are traditionally twelve or thirteen. DHYANA – a practice of thought cultivation and insight which leads to the development of higher mental states. It is not just idle nursing or a state of concentration, for it involves a discipline which is clearly and fully described in the sutras. It is often translated erroneously as meditation. Meditation in its western sense is an intellectual process. Dhyana is both a process and a state which has little to do with conventional intellectual thought. ENLIGHTENED TO CONDITIONS – see PRATYEKABUDDHAS. FORMLESS REALM – third of the three realms. Characterized by lack of any form at all. Inhabited by higher gods and sages. IGNORANCE – the fundamental error which brings about existence. The word is not used in the common sense of simply being unaware of something. Ignorance means the most basic cause in the arousal of discriminations. It is the initial perception of either existence or non-existence when in reality there is neither one nor the other. 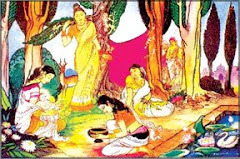 This topic is treated at very great length in the Surangama Sutra and Asvaghosa’s Mahayanasraddhotpadasastra. JAMBUDVIPA – one of the four continents of this world-system. It is located in the south, is shaped like a triangle, and is where we live. JETA GROVE – a grove of trees located within the park at Sravasti which had been given to the Buddha by the merchant Anathapindada. 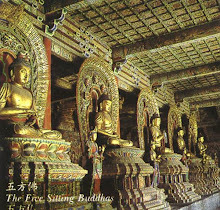 The grove belonged to Prince Jeta who offered it to the Buddha. 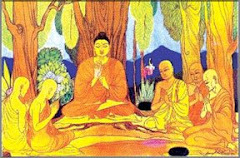 The Buddha had a lecture hall and taught many sutras there. KALPA – an aeon. These are of various lengths. The basic kalpa is 13,965 years long. One thousand such kalpas constitute a small kalpa. Twenty small kalpas constitute a medium kalpa. Four medium kalpas make a great kalpa. The lifespan of a world-system is four great kalpas. KARMA – deeds. From Sanskrit kr-, to do. Karma does not mean fate. It means the deeds which we create ourselves and the retributions which those deeds bring us. LEAVE HOME – to renounce the householder life and devote oneself completely to the Buddhist Dharma. LI MEI – a broad category covering manifold nature-spirits, which are formed from the emanations of trees, rocks, mountains, and so forth. They are malevolent and have potent spiritual powers. They correspond to such beings as trolls, bogies, and the little people in their more unpleasant and tricky moments. Such beings often grant wishes and answer petitions with such efficacy that they deceive humans into supplying them with offerings. 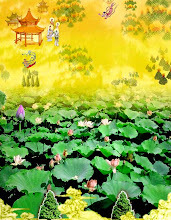 LOTUS FLOWER-NIRVANA PERIOD – The Wonderful Dharma Lotus Flower Sutra and Nirvana Sutra are ultimate teachings of the Great Vehicle. These sutras were taught during the last eight years of the Buddha’s teaching. The Earth Store Bodhisattva Sutra was taught in between those two. For a complete explanation of the Wonderful Dharma Lotus Flower Sutra see Master Tu Lun’s lectures translated by Dharma Master Hen Ch’ien. 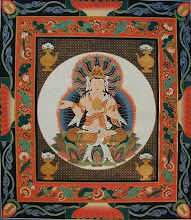 MAHASATTVA – an epithet used for great Bodhisattvas. 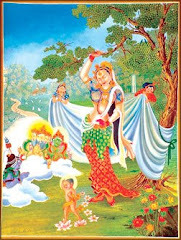 MANJUSRI – one of the greatest of the Bodhisattvas. He is renowned as foremost in wisdom. NAYUTA – an extremely large number. NINE DHARMA REALMS – nine realms of existence. They are the Dharma realms of 1) Bodhisattvas, 2) Those Enlightened to Conditions, 3) Sound-Hearers, 4) Gods, 5) Men, 6) Asuras, 7) Animals 8) Hungry ghosts, and 9) Hell-Dwellers. NIRVANA – perfect quiescence realized by enlightened sages. There are several types of Nirvana, each attained by sages of a particular level. OUTFLOWS – Sanskrit asvara. Anything which serves to divert beings away from their inherent Buddha-nature. Outflows are so called because they are turnings of energy and attention outward rather than inward. Outflows are ended by practice of the three-fold non-outflow study, i.e., morality, samadhi, and wisdom. PARAMITA – crossing over. This is a series of six, sometimes ten, practices which serve to carry one from this shore of birth-and-death to the other shore of Nirvana. 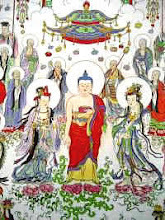 The paramitas are the foundation of the Bodhisattva practice. PRANIDHANA – vow, resolve. Part of the essential equipment in cultivation of the Bodhisattva path is vows. 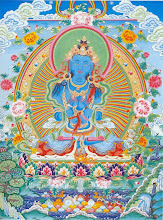 Earth Store Bodhisattva is known as foremost in the strength of his vows. PRATYEKABUDDHAS – those who attain enlightenment through contemplation of the chains of the link of causation. This specifically refers to the twelve links of conditioned co-production. REALM OF DESIRE – the lowest of the three-part division of the world. It is comprised of beings from the hells through the first six realms of the gods and is characterized by the presence of coarse desire. It includes the realm of humans. REALM OF FORM – second of the three realms. It is characterized by the presence of form but lack of desire. Inhabited by numerous grades and kinds of divine beings. REALM OF FORMLESSNESS – see FORMLESS REALM. SAHA – the name of the world-system in which we live. It means “able to endure” because the beings of this world are capable of bearing much suffering. SAKRA – chief god of the Trayastrimsa heaven, also known as Indra. SAMADHI – a wholesome state of insight attained through practice of various dharma doors. There are numerous samadhis. 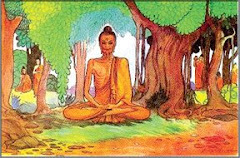 SANGHA – the community of the Buddha’s disciples who have gone forth from the home life and received the traditional ordination under procedures established by the Buddha. SASTRA – second of the three divisions of the canon. It consists of discourses and assorted writings on the Dharma, which are composed by individuals who expound different theories and interpretations of material found in the Sutras. Sastras deal with wisdom. SOUND-HEARERS – Sravakas, the Buddha’s disciples of the Small Vehicle, so called because they hear the sound of the Buddha’s voice and understand the Way. SKANDHA – constituents of the entire psycho-physical unit which we mistake for a personality. 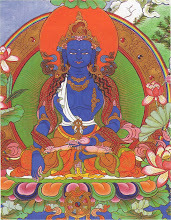 Skandhas consist of a number of impersonal elements called dharmas. 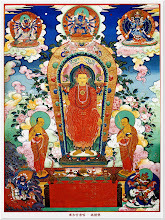 The five Skandhas are form, feeling, conceptualization, formative impulses, and consciousness. SRAMANA – a bhiksu. The word is explained as “diligently putting to rest.” A sramana diligently cultivates morality, samadhi, and wisdom and puts to rest greed, anger, and stupidity. SUMERU – the axial mountain in the center of every world system. SURANGAMA MANTRA – an extremely powerful dharani at the core of the Surangama Sutra. This dharani is one of the key dharmas taught by Master Hua and is the most effective weapon one can wield against demons and evil forces. SUTRA – the first of the three-part division of the canon, which consists of discourses by the Buddha or discourses given by various members of the assembly with the authority of the Buddha. THREE-THOUSAND-GREAT-THOUSAND-WORLDS – one world is composed of one Mt. Sumeru, one sun, one moon, four great continents; and the various seas and oceans which surround them. One thousand such worlds form a small-thousand-world system. One thousand small-thousand-world systems form a medium-thousand-world system. One thousand medium-thousand-world systems in turn form a great-thousand-world system. This set of worlds is usually referred to as three-thousand-great-thousand-world-systems to indicate that it is composed of smaller sets. TRAYASTRIMSA HEAVEN – the second of the six heavens in the realm of desire. It is the heaven in which this sutra was taught. 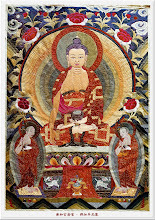 TRIPLE JEWEL – the Buddha, Dharma, and Sangha. TRIPLE WORLD – the realm of desire, the realm of form, and the formless realm. UPASAKA – a layman who has taken refuge with the Triple Jewel. UPASIKA – the feminine form of Upasaka. WANG LIANG – see LI MEI. 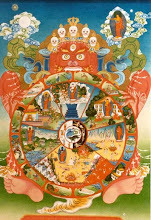 WHEEL-TURNING KING – a world-ruling monarch who uses his power to help turn the wheel of Dharma throughout the world. VINAYA – the third of three divisions of the canon. It consists of rules of discipline and training. Vinaya deals with morality. 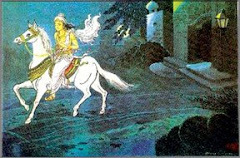 YAKSA – a type of ghost which travels extremely quickly. Yaksas serve as messengers between various parts of the world because of their great speed. 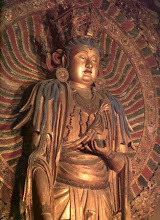 could you possibly share that image you have at the top of your blog- the Bodhisattvas and such?